About 200 people attended our recent Federal National Council election symposium organized by my College of Communications and Media Sciences and the Konrad Adenhauer Stiftung, a German foundation. Above is a picture of coverage from the local Arabic newspaper, Al Ittihad. The English-language newspaper, The National, also covered the event. We discussed the role the media played in the elections as well as ways to increase awareness of the Federal National Council, the deliberative body for which elections were held. Two newly elected members of the Federal National Council, Sheikha Eisa Ghanem Al Ari or Umm al Quainn and Salem Mohammed Al-Ameri of Abu Dhabi, joined several other Emirati observers for a discussion of the Sept. 24 elections which was marked by low voter turnout. 1) Many observers called for the FNC to have greater powers — and the leadership of the country has indicated that plan is in the works. Dr Ebtisam Al Kitbi, of UAE University, said that the FNC should be able to hold government ministers accountable. 2) Nasser Al Skaikh, a businessman and FNC candidate, hammered home the point that the news media needed to cover the FNC sessions, not just the elections. Many Emiratis still have no idea what the FNC is or what it does. He stressed that if the media did a better job covering the current FNC session, then the next elections in 2016 would feature better voter turnout. 3) Diana Hamade, a lawyer and legal rights activist, pointed out that the television coverage of the elections was virtually non-existent. Some warned that television news shows may have avoided covering any candidates, for fear of running afoul with National Election Committee campaign speech rules. She and other members also stressed that schools and universities needed to help educate citizens about the FNC. Public affairs commentator Mishaal al Gergawi stressed that Emiratis are largely politically unaware. 4) FNC member Salem Al Ameri denied that tribalism played a role in his elections, despite the fact that three of the four candidates elected from Abu Dhabi were members of the Al Ameri tribe. He said that he used advertising and social media to reach his audience. 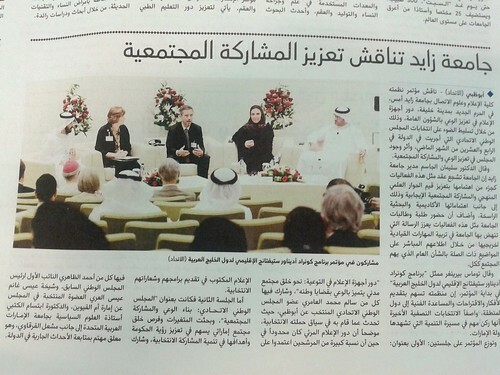 5) We discussed the urgent need for more Emiratis to take journalism positions in the UAE. Although no firm numbers are available, the vast majority of UAE journalists are ex-pats. I spoke after the forum with three Emirati journalists from Al Bayan who told me only 5 percent of their staff were Emiratis. I will post some videos of the event at some point in the future — may take a while to edit them. Later this week, I plan on working with my students to create a Storify document that highlights the best Twitter posts from the forum hashtag, #CPA11. Thanks to the fine folks at Konrad Adenhauer Stiftung, the German foundation that helped us organize the event.